Section 1 — which is split into three parts for ease of reading — lists the presidents by the order in which they held office. Section 2 consists of three tables — birth order, death order, age at death from oldest to youngest — and a figure — age at death vs. birth year. Section 3 consists of trivial facts ranging from the recurrence of names to heights. Section 4 summarizes electoral results and prospects. 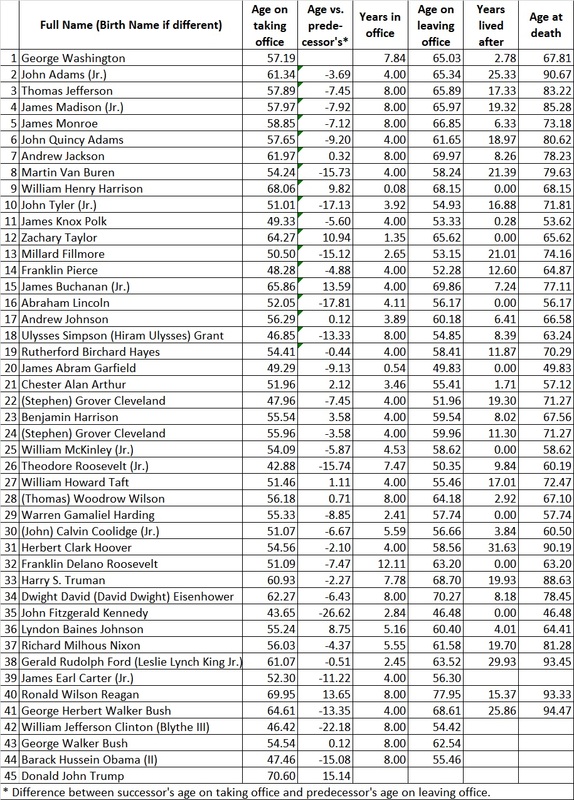 The numbers in the left column of the next two tables correspond to the order of ascension to the presidency. In the following table, living persons are listed in birth order. 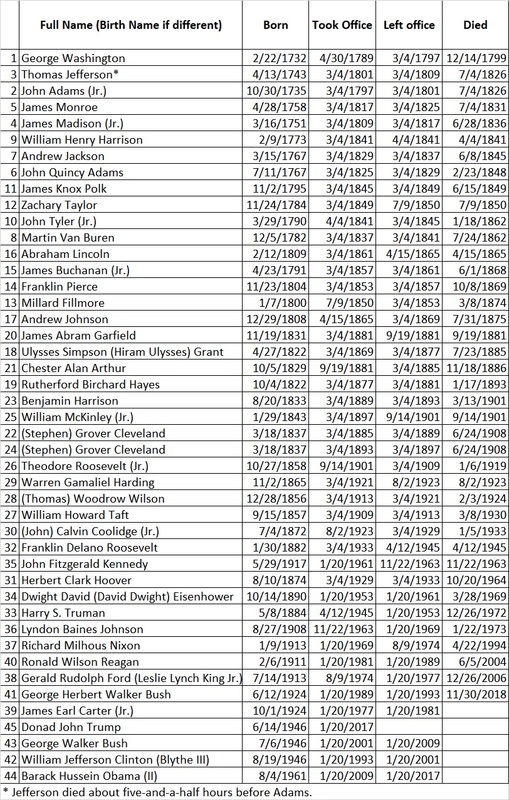 Sources: U.S. Presidents at infoplease.com; List of Presidents of the United States and List of Presidents of the United States by date of birth at Wikipedia. The graph below is derived from the preceding table. The year which saw the births of the most presidents is 1946: Clinton, G.W. Bush and Trump. There was a 24-year span between the inauguration of Clinton (the second-youngest elected president) and Trump (the oldest elected president). 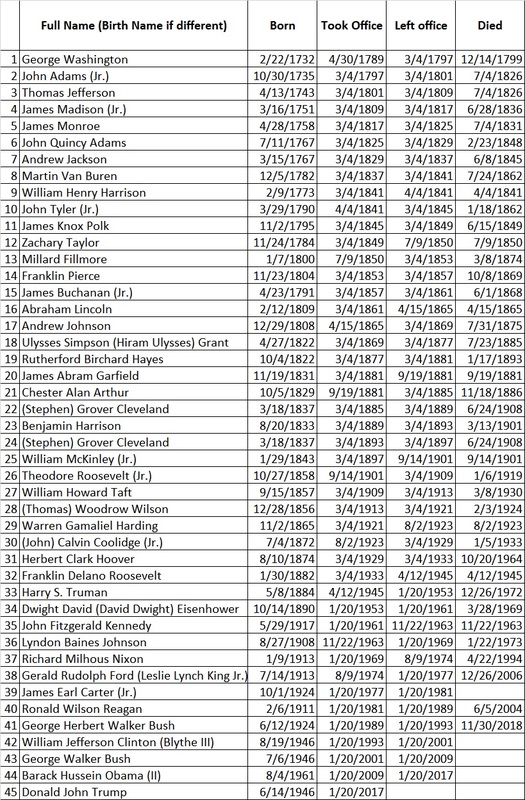 The unique first names (unique to a president, that is) are Martin, Zachary, Millard, Abraham, Ulysses (born Hiram), Rutherford, Chester, Benjamin, Theodore, Warren, Harry, Dwight (born David), Lyndon, Richard, Gerald (born Leslie), Ronald, Barack, and Donald. Fashions change, but given the current trend, the most likely names to recur are Martin, Zachary, Abraham, Chester, Benjamin, and Theodore. You will note that several letters are as yet unused: D, I, Q, S, U, X, Y, and Z. 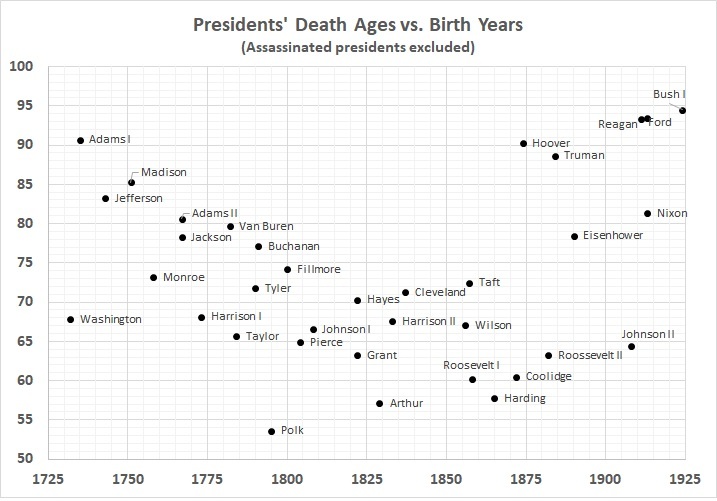 The gap between the deaths of Washington and Jefferson is 26.55 years, and so on down the list. It happens that the first gap is the longest one. The next longest gap is the 21.25 years between the deaths of Nixon and Reagan. 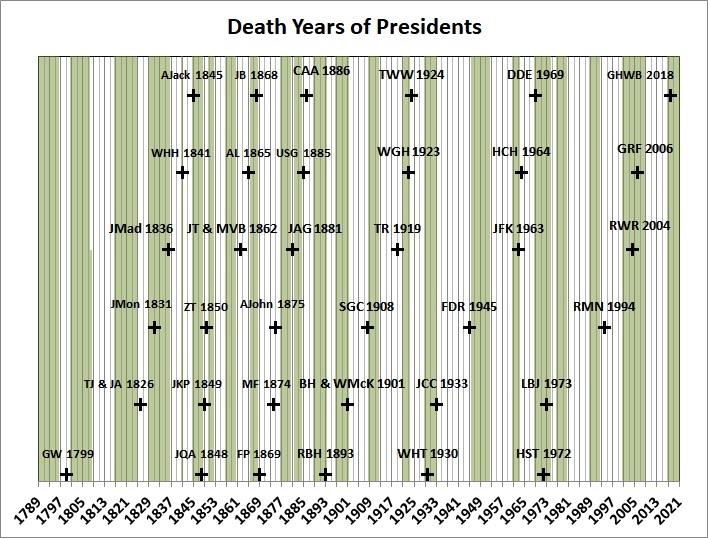 The chart below depicts the death years of presidents. The years are plotted in a saw-tooth pattern, from left to right — row 1, row 2, row 3, row 4, row 5, row 1, row 2, etc. The vertical green and white bands delineate presidential administrations. Washington’s is the first green band, followed by a white band for John Adams, and so on. George W. Bush — Ronald W. Reagan and Gerald R. Ford. 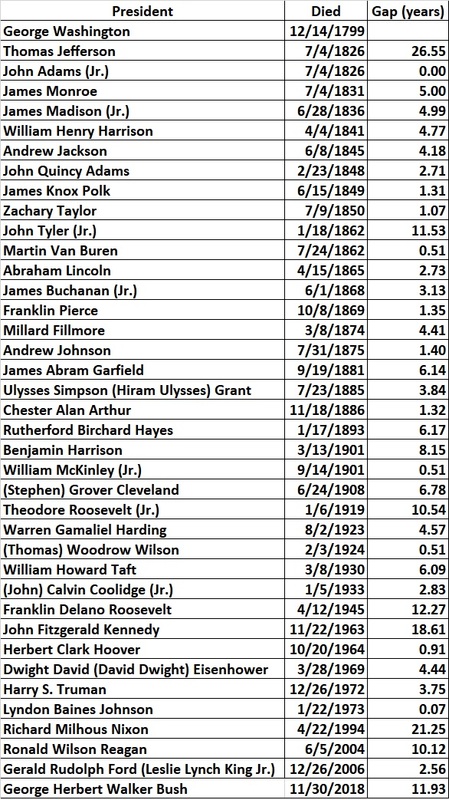 No one has yet equaled or surpassed Lincoln’s 6’4″, and only LBJ has surpassed Washington’s 6’2″ and Jefferson’s 6’2-1/2″. Note the unusual era from 1952 through 1988, when Republican presidential candidates outpolled their congressional counterparts.